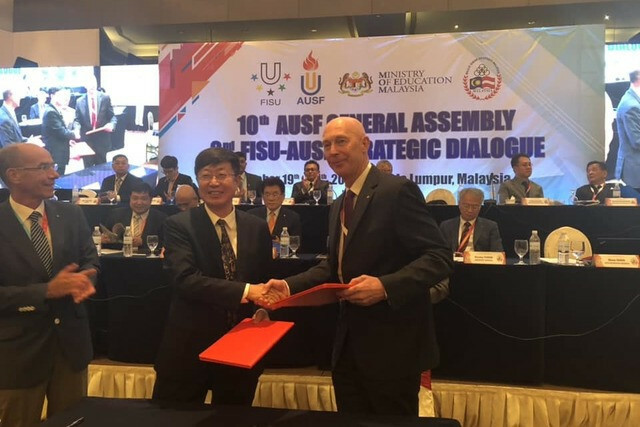 The agreement, which was initially instigated in 2016 as a trial, was signed by respective Presidents Martin Doulton and Xue Yanging at the AUSF General Assembly in Kuala Lumpur. Since 2016 the agreement has already led to projects such as a joint FISU-National University Sports Federation seminar in December 2017, and two sporting championships in futsal and cheerleading. The extended MoU reportedly looks to extend the collaboration to benefit students by various means. As part of the deal, athletes from Oceania will be allowed to compete in Continental Championships in Asia. Oceania teams will be able to qualify for AUSF events and Oceania will also be able to host such events. On top of that, at least two people from each region will now be invited to attend the Executive Committee meetings of the other as "official observers" in 2019 and 2020. The chair of University and Tertiary Sport New Zealand (UTSNZ) Nicola Clayden said students in the country have a lot to gain from the deal. "This new agreement intends to open up potential pathways for FISU Oceania students to engage with Asian universities and have access to some of their events, as the World University League does now with both Lincoln University and the University of Auckland heading to Xiamen, China next month to contest the 3x3 basketball competition," she said. "The MoU will also create more educational opportunities for UTSNZ staff and member representatives to travel and take part in joint AUSF-Oceania conferences and other developmental events in the Asia-Pacific region."